Three years ago we launched ABCmouse for Libraries, an Age of Learning Education Access Initiative that provides ABCmouse.com Early Learning Academy to public libraries at no cost. Since then, public libraries across the country have enthusiastically embraced ABCmouse. We are excited to share that ABCmouse is now available in more than 7,000 libraries—close to 50% of all public library branches in the U.S.
To date, children have completed more than 2 million ABCmouse learning sessions in public libraries, and usage continues to grow. ABCmouse is available in large and small library systems in virtually every state and more than 70% of the largest 200 library systems, including all branches of the Los Angeles Public Library, New York Public Library, Chicago Public Library, and Houston Public Library. 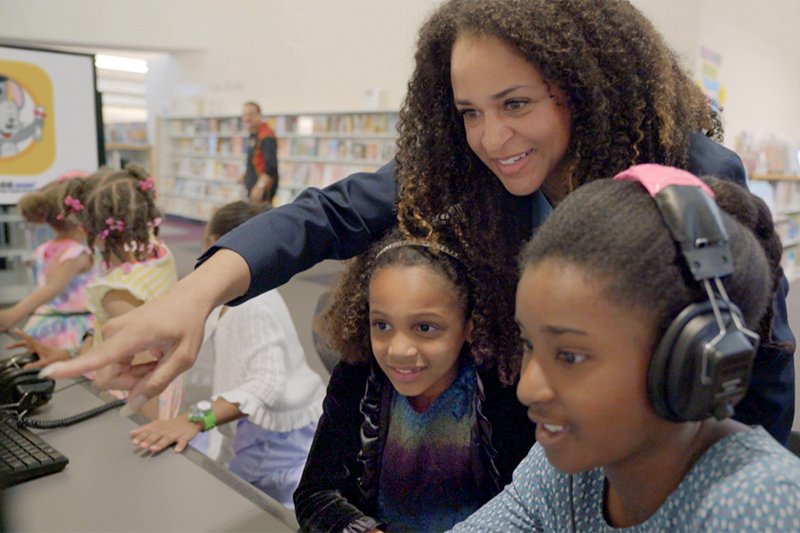 For a firsthand look at the impact ABCmouse is having in libraries, watch this brief video. We launched ABCmouse for Libraries because of the critical role libraries play in serving at-risk children. Families living in poverty are more likely to visit a library than any other community cultural or educational institution, such as a bookstore, theater, or museum (Institute of Education Sciences, U.S. Department of Education 2016). Since launching, we’ve continued to expand and strengthen ABCmouse for Libraries, adding a comprehensive curriculum for 1st and 2nd grade, Spanish-language Learning Activities, tablet compatibility, and more. Earlier this year, in response to demand from librarians to enable their patrons to “check out” ABCmouse accounts, we launched the Bring Learning to All initiative. This initiative makes ABCmouse available for families to check out from their library and use at home for 4 to 6 weeks at a time. Families gain access to all 9,000+ ABCmouse Learning Activities, the ABCmouse Assessment Center, and a growing set of ABCmouse mobile apps that do not require Internet connectivity. Supplemental technology kits that include tablets with mobile broadband can also be provided to libraries for checkout. Currently available in select libraries in California, Florida, and New York, this initiative brings together public libraries, funders, and in-kind contributions from Age of Learning to make ABCmouse available to families who may not otherwise be able to afford such resources at home. Thanks to the generous support of partner sponsors including Southern California Edison, the California Community Foundation, PNC Bank, and others, we are making this program available to more and more families. We look forward to continued collaboration with library partners to help children in all communities build a strong foundation for future academic success. Libraries interested in offering ABCmouse at no cost to patrons can sign up for a free account here. Libraries and funders interested in participating in Bring Learning to All can email BringLearningtoAll@AofL.com for more information.